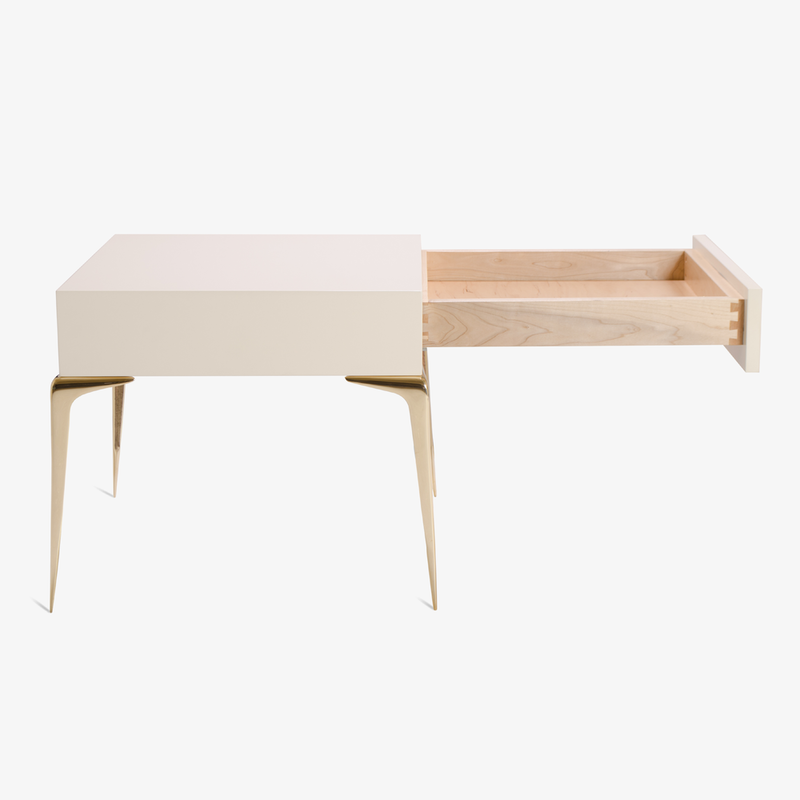 The Colette Petite Nightstand, skilfully executed carpentry with polished brass hardware. Colette was designed with the delicate proportions of the Mid-Century, celebrating an era of design that remains ever so popular today. The Colette Collection is designed and manufactured in-house by Montage. The shown wood finish is maple in a high-gloss Lacquer in Ivory. The dovetailed drawer is generous in size for optimal storage equipped with hidden undermounted soft-close glides. The brass legs, Italian in origin, are cast and polished in the USA (optional nickel-plated hardware available upon request). The jewelry-artisan crafted brass "Moon" medallion is exclusive to the Colette collection, a well scaled pull and a spectacular piece of organic design in itself. Every piece in this collection is made to order to ensure excellence in craft. This enables us to design bespoke pieces upon client request. Every specification of our design can be altered to accommodate the requirements of any project. Alterations include wood finishes, lacquer colors, single tone or two tone, the choice of either standard polished brass or nickel plated hardware; and of course overall dimensions. Contact Montage with inquiries regarding customization, orders of quantity, or any general questions.